Athens, Greece – Three years ago, Sara Mardini and her sister rescued 18 refugees in the Aegean Sea, diving into the water and guiding their sinking dinghy to dry land on Greece’s Lesbos Island. Mardini and her sister Yusra, who went on to swim in the 2016 Olympics, were subsequently lauded as heroes and gained international notoriety. She went on to work with the Emergency Response Centre International (ERCI), a nonprofit organisation on Lesbos, before eventually continuing their journey to Germany. In late 2017, she returned to Lesbos to volunteer with ERCI again. But now 23-year-old Mardini is behind bars in Korydallos Prison, a high-security facility near Athens, and three of her ERCI colleagues have been arrested, as well. Authorities arrested them on August 21 and dealt them daunting charges ranging from people smuggling to espionage and membership in a criminal organisation. Under Greek law, they can be held in pre-trial detention for up to 18 months. Greek police detained Mardini at the island’s airport as she prepared to travel back to Germany for university studies. Her lawyer, Haris Petsalnikos, maintains that she was not in Greece during many of the incidents detailed in the allegations and has called for her release. The accused individuals include ERCI field director Nassos Karakitsos, a Greek citizen, and volunteer Sean Binder, a 24-year-old German national. A third individual who was charged has requested that his name be withheld, according to the organisation. In a press release, Greek police said the NGO facilitated “the illegal entry of aliens into Greek territory” and provided “direct assistance to organised illegal immigration networks”. The statement added that police are investigating 30 individuals in connection to the case, which includes allegations of human trafficking, money laundering, spying and counterfeiting, among others. A week after the arrests, the ERCI published a statement dismissing the “unfounded claims, charges and accusations”. Panos Moraitis, a 39-year-old Greek national who founded the ERCI in December 2015, said he plans to present himself to authorities in Lesbos in the coming days and expects to be arrested, as well. Rejecting the allegations, Moraitis explained that he decided to join a swell of volunteers heading to Greek islands as the refugee crisis unfolded in 2015. Each morning while commuting to work, he would listen to the radio and hear updates from Lesbos as tens of thousands of refugees reached the island. “I heard the news every morning, and I saw the photos,” he recalled, speaking to Al Jazeera by telephone. “What really tipped me over was what convinced thousands of people to volunteer: the photo of Aylan Kurdi,” he recalled, referring to a Syrian toddler whose lifeless body washed up on Turkish shores in September 2015. At the time, images of Kurdi went viral and made international headlines. “My wife was pregnant with my daughter then, and I knew I had to do something,” Moraitis said. Advocates say the arrests are part of a broader wave of clamping down on volunteers, aid workers and activists who have worked with refugees and migrants fleeing war zones and economic devastation in the Middle East, Africa, and South Asia. In 2016, Greek police arrested a pair of Spanish activists who were attempting to help transport refugees from the country, in the port city of Igoumenitsa. In March, Italian authorities launched an investigation into Proactiva Open Arms and seized a rescue ship, accusing three individuals of criminal activities related to facilitating migration to the country. Two months later, three Spanish firefighters were put on trial for helping refugees enter the EU on Lesbos. Those charges could land them behind bars for 10 years. In Hungary, far-right Prime Minister Viktor Orban’s government passed into law in June a measure prohibiting individuals and NGOs from providing aid to refugees and migrants entering the Central European country. Nassim Lomani, an Athens-based activist who came to Europe from Afghanistan two decades ago, said the effort to crack down on rescue workers, NGOs and refugee solidarity activists comes at a time when the EU seeks to stem the flow of refugees and migrants to the continent. In recent months, several European countries, among them Germany, Austria and Italy, have sought to limit the entry and movement of asylum seekers. Last month, Germany struck a deal with Greece to return asylum seekers to the Mediterranean country if it was their first port of entry into the bloc. In Italy, the newly-appointed far-right interior minister, Matteo Salvini, has prompted outrage across the continent by refusing to allow refugee boats to disembark on the country’s shores. In late August, Salvini initially blocked a boat carrying some 177 people from unloading, leading to a nearly week-long standoff. But in Greece boats continue to arrive, despite declining living standards in the overcrowded camps, particularly on the islands, and the apparent attempts to discourage rescue workers and activists. According to the United Nations refugee agency (UNHCR), more than 21,000 refugees and migrants have reached Greece in 2018, a number that pales in comparison to the nearly million who passed through the country three years earlier. 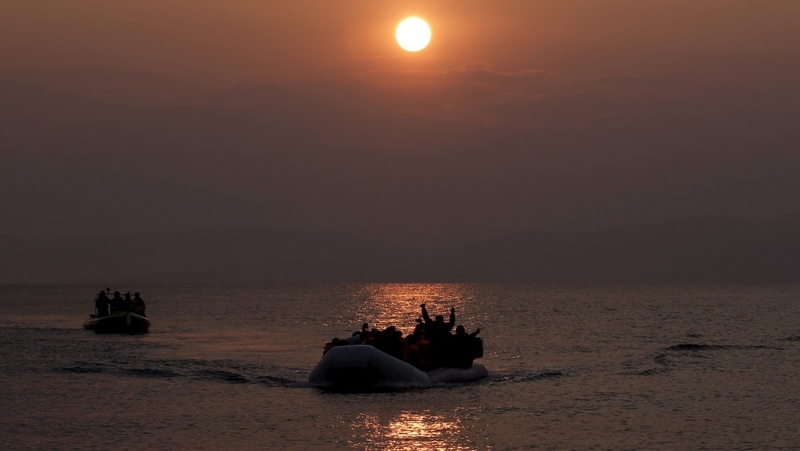 On Thursday, the Greek coast guard retrieved 65 people on a boat in the Mediterranean near southwestern Greece, according to the local daily Ekathimerini. Arrivals have also swelled on the country’s land border with Turkey, where a growing number of people cross the Evros River to enter Greece. Meanwhile, with the charges pending against four of its members, the ERCI has suspended all its operations indefinitely. Among those services was a clinic in Moria, a cramped refugee camp on Lesbos, and programmes in the nearby Karatepe camp. “Based on what I’ve seen till now, our people are being prosecuted for doing nothing wrong,” Moraitis said. “It feels like the authorities want to make an example out of us to scare others from doing search-and-rescue,” he concluded.